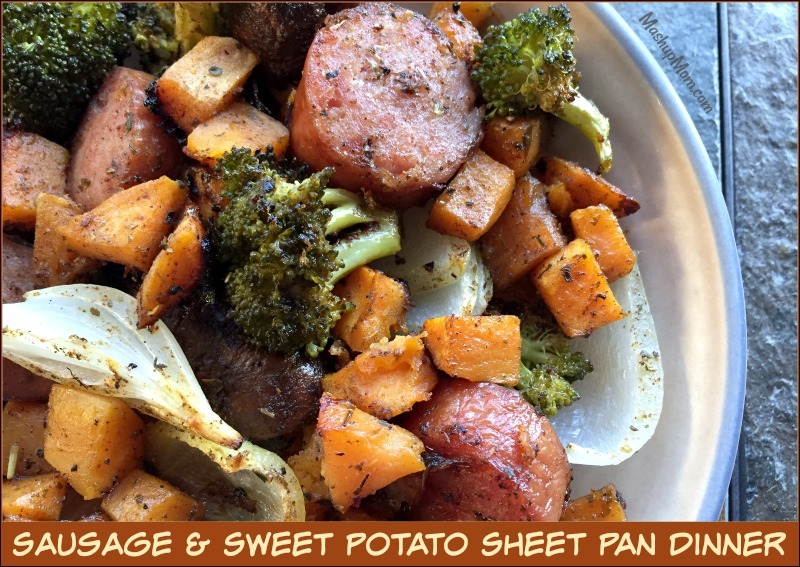 All you need to make your own sausage & sweet potato sheet pan dinner is a 14 oz smoked sausage or Polska kielbasa, plus a few veggies. Just chop and toss these together with olive oil & spices, and then roast everything together on one sheet pan until done. You can’t get much easier than that, and this particular easy sheet pan dinner takes just 45 minutes from start to finish. Preheat oven to 425 degrees and spray a rimmed baking sheet with cooking spray. 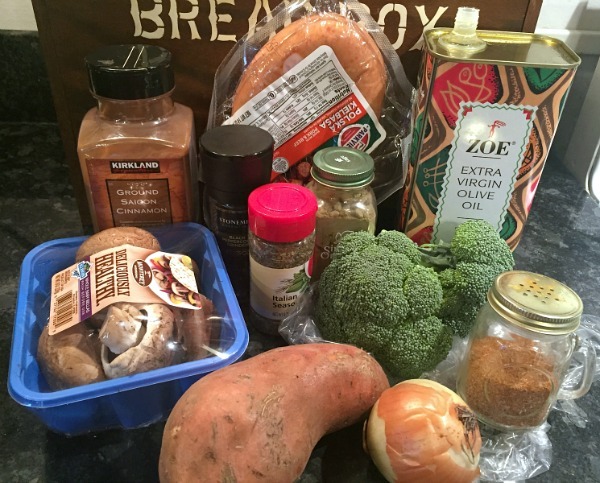 Add sweet potato, broccoli, mushrooms, onion, and smoked sausage to a large bowl. 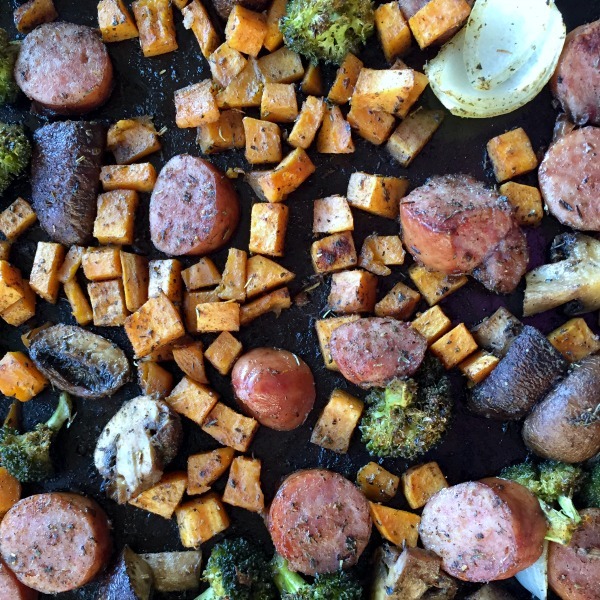 Drizzle with olive oil and add all seasonings, then toss until sausage and veggies are well coated. 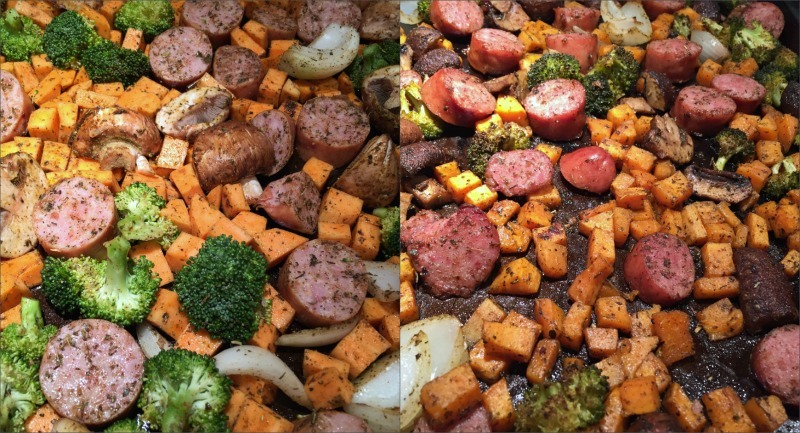 Arrange sausage and vegetables in a single layer on your prepared baking sheet (it’s OK if they’re a little crowded; they’ll shrink down). Roast at 425 degrees for 30 minutes, stirring halfway through, or until sweet potatoes are softened and everything else is nicely roasted. 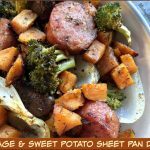 This sausage & sweet potato sheet pan dinner recipe is also naturally gluten free. Just a touch of sage and cinnamon work together to make this a savory all-in-one dinner recipe for a cool fall or winter's day. 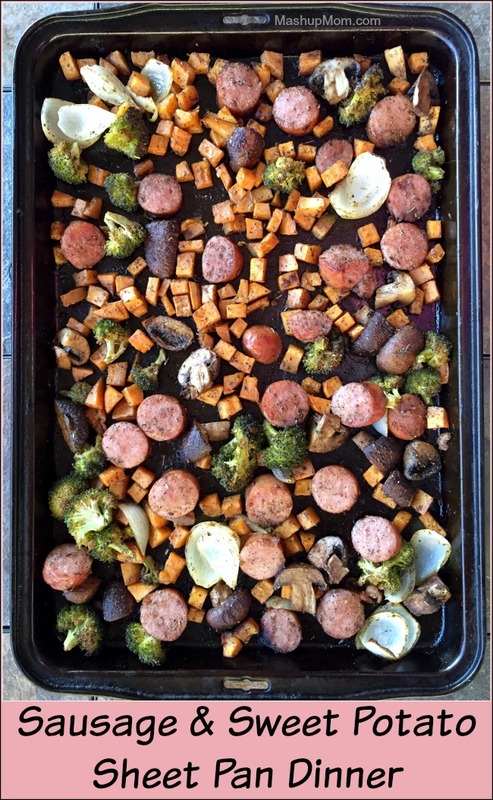 Arrange sausage and vegetables in a single layer on your prepared baking sheet (it's OK if they're a little crowded; they'll shrink down). Roast at 425 degrees for 30 minutes, stirring halfway through, or until sweet potatoes are softened and everything else is nicely roasted. I’m wondering, is the sausage in this recipe pre-cooked like other pre-packaged sausage products often are? So roasting it would be essentially “crisping it up”? This recipe is one of our favorites! We usually use the raw brats or sausage and par-boil, slice, and then continue as usual, if you don’t have the pre-cooked sausage.